From the Dottie Rambo Elvis Presley Collection. Elvis Presley gave this hand inscribed and handmade red bookmark to singer and songwriter Dottie Rambo. Dottie and Elvis were very good friends, and Elvis recorded some of her songs. The bookmark was actually inside a bible he gave her (the one offered here in this auction) one night in the 1970's when the Rambo's were visiting Elvis in Las Vegas. Dottie was worried about his health, and in an effort to distract her he offered to buy her a car, saying, "Name it! I'll give you anything!" She told him she'd like to have it bible and he gave it to her. 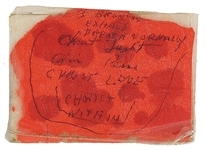 Inside the bible was this red bookmark that Elvis had made for himself and upon which he had made handwritten notes to himself in ballpoint pen, including the phrase "Christ Love". 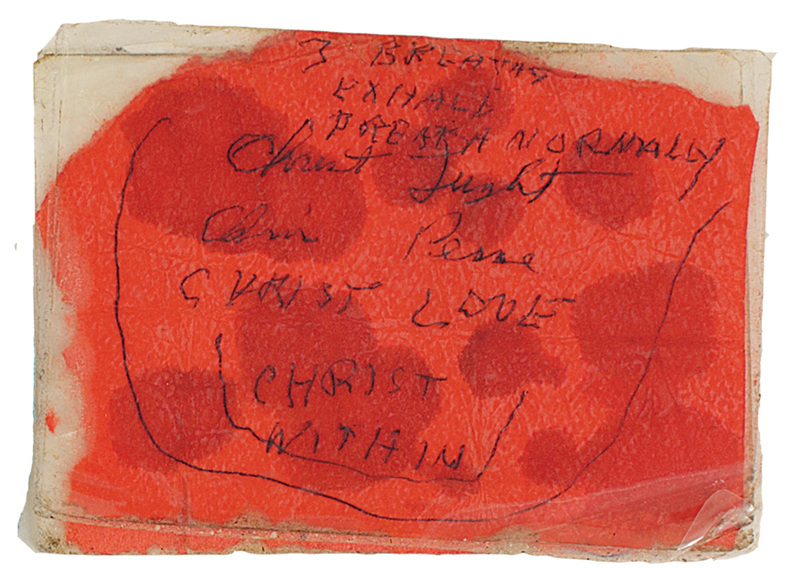 The notes were handwritten by Elvis in black ballpoint pen on red paper or cloth, and then attached on a clear plastic card with thick plastic tape on top of it. Dottie kept this bookmark in a secure location, close to her, for the rest of her life. Measures 4 x 3. Good condition. The bookmark comes with a letter of provenance from Dottie's family and a Gotta Have Rock & Roll™ Certificate of Authenticity.